Image Credit: Sean Murphy. DC Comics. Not from Batman: Last Knight. Talking at New York Comic-Con, Scott Snyder said that Grant Morrison once advised him to give his superheroes “a birth and a death.” So for the upcoming Batman: Last Knight, Snyder is working to give his Batman an ending. And it sounds like a doozy. For the story, which has no release date as of yet, Snyder is collaborating with Sean Murphy, who he previously worked with on Vertigo’s American Vampire and The Wake. 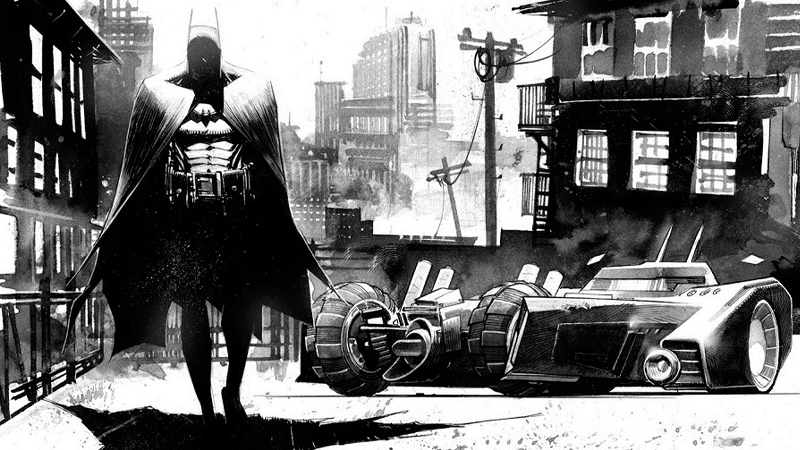 Murphy’s no stranger to Batman titles, as he’s currently working on Batman: White Knight, an alternate continuity take on Batman with a reformed, and possibly even heroic, Joker. Batman suddenly wakes up and he’s... young. But he wakes up in this post-apocalyptic wasteland, crawling out of the sand in this Gotham City that’s been ruined. He’s got the Joker’s head chained to his belt, but it’s alive and like, ‘You gotta move, kid!’ It’s got old Wonder Woman, Baby Superman—it’s like my Lone Wolf and Cub Batman story. He has what on his belt now? I can’t say I understand where you’re taking this, Scott. But I’m paying attention.